jMBus is an implementation of the M-Bus wired and wireless protocols. You can use it to program individual M-Bus wired masters or wireless M-Bus receivers that read meters such as gas, water, heat, or electricity meters. For M-Bus wired communication the library communicates over a serial port or USB port with an M-Bus master/level-converter device. We have successfully tested the library with level-converters from Relay. Wireless M-Bus communication requires a serial transceiver hardware, usually connected via USB. Currently jMBus supports transceivers from Amber, IMST and Radiocrafts. The library was tested with the AMB8465-M and AMB8665-M from Amber, the IM871A-USB from IMST and the RC1180-MBUS rom Radiocrafts. The jMBus only supports passive listening for messages in modes S, T and C2 at the moment. Encryption modes 1 and 5 are supported. Figure 1. M-Bus master in a sample wiring. The first thing to do in order to communicate with a M-Bus device is to establish a new connection. You can build a TCP or a serial connection. Opening a new M-Bus serial connection. Opening a new M-Bus TCP connection. 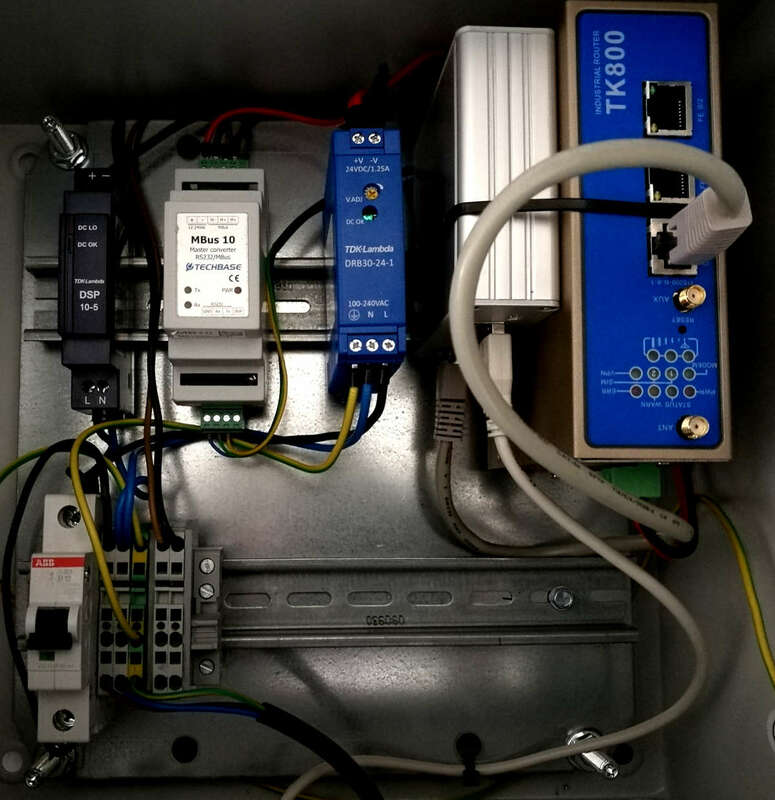 Once the connection has been successfully established it can be used to read data from meters by calling the read method. The following line reads a meter at primary address 1 by sending a REQ_UD2 message and waiting for RSP_UD message response. The variable data structure of the response is returned by the read function. Next the variable data structure can be parsed as explained below. An active connection can also be used to write data to a meter. The following line writes 0x017a09, by calling SND_UD, to a meter with primary address 5. This write command will change the primary address from 5 to 9. Try the CLI APP described in Command Line Application. First a wireless connection needs to be established. The following line creates a connection (receiver) for transceivers by Amber using mode S.
You can then set keys that will be automatically used to decode received messages using encryption mode 5 (AES with CBC and IV). Opening a new wreless M-Bus connection. The listener passed to the wireless M-Bus builder has to implement the callback method newMessage(WMBusMessage). This way the connection passes received messages to the application. Before accessing elements of a variable data structure it has to be decoded using the decode method. The library is distributed with a demo CLI application. You can run the CLI APP using the script found in the folder /run-scripts. The file ending with .sh is a shell script for Unix/Linux/Mac. The file ending with .bat.winfile is a batch file for use with Windows. In order to run the script in Windows you have to rename the batch file by removing the “.winfile” ending so that it simply end with “.bat”. Executing the script without any parameters will print help information to the screen. Instead of running the application from the terminal you can create Eclipse project files as explained here: https://www.openmuc.org/faq/ and run them from within Eclipse. jMBus depends on the Java library jRxTx. jRxTx is a fork of RxTx and is hosted at https://github.com/openmuc/jrxtx. The library is licensed under the LGPL(v2.1 or later) + linking exception. Note that you have to install the native part of RxTx as explained in our FAQ. This chapter gives a short introduction into the M-Bus protocol. Further information can be found in the standard documents (EN-13757 parts 1-4,IEC-870-5 parts 1-2) and on http://www.m-bus.com . Wired M-Bus has a bus topology where a single master can communicate with up to 250 slaves (even more when secondary addressing is used) via a twisted pair cable. The master communicates with a slave using voltage changes (36/24V) and a slave communicates with the master using current changes(1.0/1.5mA). The current can optionally be used by devices as a power supply. M-Bus devices are protected against polarity reversal and may use a baud rate between 300 Baud and 38400 Baud. Most meters use 2400 Baud. Wired M-Bus differentiates between five different frame types: single character (the byte 0xe5 is used for confirmation purposes), SND_NKE (send link reset), SND_UD (send user data), REQ_UD1 (request user data 1), REQ_UD2 (request user data 2) and RSP_UD (respond user data). The most common M-Bus message exchange is the request/response service where the master sends a REQ_UD2 frame addressed to a specific slave (usually a meter) and the slave answers with RSP_UD message containing all the current measurement values. The REQ_UD2 frame contains only the primary address (1 byte) of the slave that is to be read. A master cannot address certain data points it wants to read. Instead the slave always answers with a complete list of its data. A slave that successfully receives a REQ_UD2 message with a matching address replies with a RSP_UD frame. All other slaves that receive the request do not answer. The RSP_UD frame contains the address of the slave sending the frame, a control information (CI) field equal to 0x72, 0x78 or 0x7A and a variable data structure that is explained further down. The CI field may have other values if an application layer other than the M-Bus application layer is used (e.g. COSEM). The jMBus library only supports the M-Bus application layer. 255 is a broadcast address. A device that receives a message with address 255 never replies to it. Sending REQ_UD2 frames to the broadcast address makes therefore little sense. 254 is also a broadcast address. This time all slaves shall answer requests which may lead to collisions and is only meant for testing purposes. 251 and 252 are reserved and should not be used for now. 0 is used by unconfigured slaves. They can later be assigned to other addresses using secondary addressing. 253 indicates that secondary addressing is being used. Unconfigured slaves usually have a primary address of 0 assigned. In this case the master can still address the slave using secondary addressing. Secondary addressing works using two message exchanges. First the master sends a SND_UD frame addressed to primary address 253. The SND_UD frame contains the secondary address of the target slave. The addressed slave replies with a confirmation (single character). This mechanism is called selecting a slave. Next the master can read the slave by sending a regular REQ_UD2 frame again to primary address 253. Only the selected slave will answer the request. Identification Number (4 bytes) – A number ranging from 00000000 to 99999999 to identify the meter. Manufacturer ID (2 bytes) – Three letters that identify the manufacturer. Version (1 byte) – Specifies the version of the device. The version is manufacturer specific. Wireless M-Bus communication uses frequencies between 868 MHz and 870 MHz. Different physical layer modes are available. The two most common modes are S and T.
In S mode a meter sends messages in regular intervals (e.g. every 15 minutes or every 2hours). Messages sent have a long message header. If the meter is only sending messages and not listening for messages the meter is said to use the mode S1. If the meter is also listening for messages the mode is called S2. The S2 mode requires significantly more power. Therefore devices using S2 are usually not battery powered. A gateway that collects data from meters always uses the S2 mode. In mode T the meter sends data more frequently (usually every few seconds) with a shorter message header. Again the meter can only send data (T1) or also listen for data (T2). A meter in T2 mode only listens for incoming messages for a short time after having sent a message. A gateway in T2 mode will constantly listen for messages instead. Several wireless M-Bus frame types exist: SND-NKE, SND-NR, ACC-NR and more. The data frames that meters transmit in regular intervals are called SND-NR (send without request). SND-NR is the most common frame type and it is the only frame type that jMBus supports. The SND-NR frame contains the secondary address of the sender. This uniquely identifies the sender. Note that the sender may not necessarily be the meter that the data is originating from. The meters secondary address can be specified in the variable data structure as explained below. Keys used to encrypt and decrypt M-Bus messages are associated with a specific secondary address. Finally the SND-NR frame contains a CI field equal to 0x72, 0x78 or 0x7A and a variable data structure that is explained further down. Often the variable data structure of wireless M-Bus frames only has a short data header instead of a long header (as in wired M-Bus) because the secondary address is already transmitted in the data link layer. The variable data structure is the part of an M-Bus frame that contains the measurement data. Its format is defined as part of the M-Bus application layer in EN 13757-3. Access number (1 byte) – is a counter of how many times a meter has been read (wired M-Bus) or a meter has sent data (wireless M-Bus). For detailed information on when the access number is incremented see EN 13757-3. Status (1 byte) – Codes the status of the metering device. For example a device can signal that it is running out of power or is in an error state. Configuration (2 bytes) – the configuration field contains information about the encryption mode and the number of encrypted bytes. Wired M-Bus usually uses no encryption while wireless M-Bus meters often do. Only data after the data header may be encrypted. A long data header contains the secondary address of the meter in addition to all the fields of the short header. Data records – Data records (sometimes called variable data blocks) contain the measured data. Each data record is made up of a data information block (DIB), a value information block (VIB) and a value. Similar to OBIS codes DIBs and VIBs code information such as the meaning of a value. Storage number – a meter can have several storages e.g. to store historical time series data. The storage number 0 signals an actual value. Data value type – The length and coding of the data value field following the DIB and VIB. Possible value types are 8/16/24/32/48/64 bit integer, 32 bit real, 2/4/6/8/12 digit binary coded decimals (BCD), date and string. In addition the value type “none” exists to label data records that have no data value field. Tariff – Indicates the tariff number of this data field. The data of tariff 0 is usually the sum of all other tariffs. Subunit – Can be used by a slave to distinguish several subunits of the metering device. Unit – The unit of the data value. Manufacturer specific data (optional) – Manufacturer specific data may optionally be appended at the end of the frame. This is essentially an array of bytes that is not standardized by the M-Bus standard.